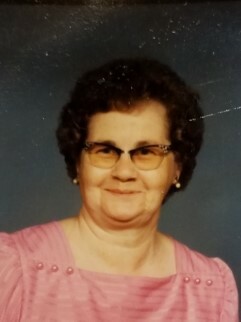 Lois A. Bonecutter, 92, of Hamilton, died Tuesday, Dec. 4, 2018, at The Laurels of DeKalb Nursing Home in Butler. Mrs. Bonecutter was a homemaker. She was a member of the Hamilton Church of Christ and the Fidelis Christian Workers. She was born June 9, 1926, in Auburn to the late Clarence and Hazel (Curry) Norrick. She married Thomas W. Bonecutter Jr. on July 3, 1945, in Butler, and he died May 20, 2002. Surviving are three children, Robert W. Bonecutter of Hamilton, Jean A. (Donnie) Chriswell of Hamilton, and Lois J. Fett of Hamilton; 11 grandchildren; 26 great-grandchildren; and 16 great-great-grandchildren. She was preceded in death by her parents; husband; son, Bill Bonecutter; and two sisters, Evelyn Mann and Violet Pratt. Services will be 2 p.m. Saturday, Dec. 8, 2018, at Feller and Clark Funeral Home, 875 S. Wayne St., Waterloo, with visitation from 1-2 p.m. Saturday prior to the service at the funeral home. Pat Baughman will be officiating. Burial will take place in Hamilton Cemetery. Visitation also will be from 2-8 p.m. Friday at the funeral home.